elrow's popularity in the USA has apparently having grown from 800 attendees in New York in December 2016 to complete sell-outs at Avant Gardner, plus consecutive sold out editions at Miami Music Week and Las Vegas. The elrow Town festival has also expanded to four cities throughout 2019. 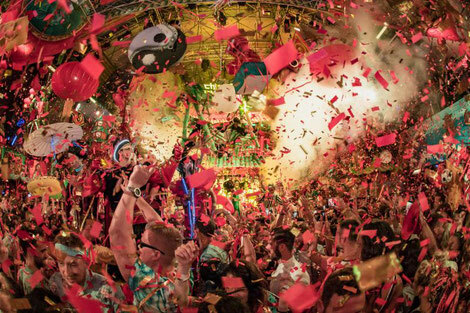 While the city is famed for its big name takeovers, including Cardi B, Drake and Lady Gaga, for this event Encore Beach Club is drenched in dazzling colour and confetti for months on end. Alongside Wynn, an array of characters and DJs will transport dancers into whichever vibrant world Rowgelia chooses, aiming to leave an impression. Alex Cordova, Wynn Managing Partner, says: "Building on the success of last year, Wynn Nightlife has secured an unparalleled lineup of top acts from the genres of house and techno for 2019. We are proud to bring distinctive sounds and brands from around the world to the entertainment epi-center of Las Vegas."